Disclaimer: I have been friends with the owners of this new restaurant for many years. Tommy Nevins in Evanston was a great pub for its first 8 or so years. In recent times it has changed, in ownership as well as focus. THey have introduced tv's, live music, and have been steadily moving away from being an Irish pub to a club like atmosphere. I am not a big fan of clubs so when the previous manager, head chef, head bartender, along with several other bartenders and staff announced they were opening a new irish pub in Evanston I was excited. It's bee nopen a few eeks now and I already feel at home there. Good Guinness and craic. Burgers are good, they will cook them rare if you ask, the Guinness and beef Pasty is Denise's favorite, a turnover filled with meat, mushrooms, and a nice brown sauce. The cod and chips were very fresh, so much so that the breading slipped off a bit, I can live with that. The sauces are great and a cut above bar food. The tarter sauce is creamy and complex. The corned beef and cabbage comes with a Colmans cream sauce and good carrots and potatoes. All in all a definite step above bar fare. They just started serving dinner and I tell you it looks good, the last time I was there the person next to me had pecan crusted pork chops that looked fantastic. The ploughmans lunch was good but the Stilton was a bit muted and it could use more bread. I havent had many desserts but the sticky toffee was tasty, a half sphere of light yet rich toffe in a bready matrix with a drizzle of caramel sauce and a (I think) melted ice cream creamy vanilly sort of sauce surrounding it. I ate it all. But will come back, my office is in the building! Octarine wrote: The corned beef and cabbage comes with a Colmans cream sauce and good carrots and potatoes. Oooh! That sounds awesome. I've been in love with the Colman's flavor ever since I had some at the Elephant & Castle, so I bought a can of the powder. Does anyone have a good recipe for mustard made with it that doesn't involve cooking or dairy? Sounds like a place I should try the next time we are up in Evanston. As far as recipes with Colman's mustard, my mother used to rub it straight from the can on lamb chops before grilling them, along with a little Lawry's salt. Then sprinkle with a little fresh chopped parsley before serving. It's still my favorite way to eat lamb. Believe that you can make a tasty mustard sauce simply by mixing the Colman's with cold water or - even better - a little cold beer [or ale - stout might be too strong]. Several weeks ago while munching Polish sausages with Cathy2, nr706, Seth Z and Octarine we agreed The Celtic Knot would be a good choice for the September Evanston lunch. It's in downtown Evanston which is convenient for those with limited lunch time. Octarine tells us the chef was formerly at Tommy Nevins, where I've had a number of good meals over the years. Normally Evanston lunches are the second Thursday of the month which would make this one September 8th. Time is usually at 12:30. However, we're coming up on Labor Day and some people will be away next week. Is the 8th OK with the group or should we put it off one week to September 15th? Please post comments/interest/availability. I can make it either day. Note: Subsequent to the above-mentioned sausage meeting, Crazy C posted a suggestion of New Japan (Chicago Avenue just north of Dempster) for an Evanston lunch. I'd be happy to try it, perhaps in October. Celtic Knot is great with me - I've been there a couple of times and thought the food was maybe a little better than Toimmy Nevin's. And either date is fine with me. I'll be there! In fact I had lunch there yesterday, lamb burger with a mint, onion, and tomato relish with home made potato chips. Good, but I prefer my lamb roasted on the bone. Deb (head chef) let me try a new soup Javier (one of the cooks) is working on, a spinach potato soup. It was smooth with a very bright spinachy flavour and a tiny garnish of parsley. The consistency was a bit too close to baby food which I commented on, they may toss in some chunkies to liven it up. I also recommended a roasted red pepper puree or similar on top as well to give a it a bit of depth. Yesterday's lunch was very nice indeed. Good food and conversation with Octarine explaining about kitchen design. Octarine, who knows the owners, told us many of the staff at the Celtic Knot , including the chef, had moved from Tommy Nevins after a change in ownership at the latter. nr706 said he had been at Nevins recently and felt the food had fallen off. Apparently the new owners are trying to make Nevins more like a sports bar. We started with an the traditional brown bread which is offered as an appetizer ($2.95, served with Kerrygold butter). It had lots of flavor and texture, definitely my kind of bread. I had the Shepherd's Pie ($8.95) which was quite good. It's made with ground beef, peas & onions and topped with duchess potatoes. A tasty dish with a good broth -- far superior to the "unconventional shepherd's pie" I had a Prairie Grass some months ago. Octarine and Cathy 2 both had the goat cheese salad with grilled steak on top ($3 extra). It was excellent. nr706 went with the daily pub lunch ($5.95) which was a roast beef sandwich that day. The menu is larger and has more variety than the typical pub. There usually is a fish dish or two available. Octarine thinks the best dishes are the traditional ones such as the shepherd's pie and the lamb stew, although he allows that he's never had a bad meal there. Service was very friendly. I'll gladly go again. At the recommendation of Octarine, the Evanston lunch this month was at the Celic Knot. While I am generally not thrilled with Irish food, I was really pleased with this Irish food. We began our meal with Irish Brown Bread and Butter, which the menu promises "Direct from the old country." I don't know about the bread but the butter was imported from Ireland. It was really quite good and well worth the $2.50, which when I read it initially I was immediately cast into a Missourian role of "Show Me!" Ok, it was very good and worth it. Octarine gave a run through of what to eat, promised everything was great with only some reservation for lamb burgers. We learned Octarine is a mutton man, so the only reservation for the lamb burger was the taste wasn't strong enough. Given his frame of reference, I predict most would find the lamb burger quite satisfactory. I was really on the fence on what to eat because there was a lot I was interested in. However, when Octarine ordered his favorite 'Fried Goat Cheese on a Bed of Mesculun Greens' with bacon, walnuts, raisins and balsamic dressing plus a side of rare steak. I happily followed his leader. Octarine quiped this was a man's salad due to the fried goat cheese and addition of steak. It may be a man's though it certainly was a terrific salad with all his enthusiastic praise proven true. George R ordered the Shepard's Pie, which is ground beef cooked with onions and peas, seasoned with rosemary and thyme and topped with duchess potatoes. The sample George R offered indicated this was a worthy candidate for a future meal. nr706 had a roast beef sandwich, which I forgot to photograph, though he seemed pleased. Celtic Knot also serves 'High Tea'. A very good find Octarine, thanks! 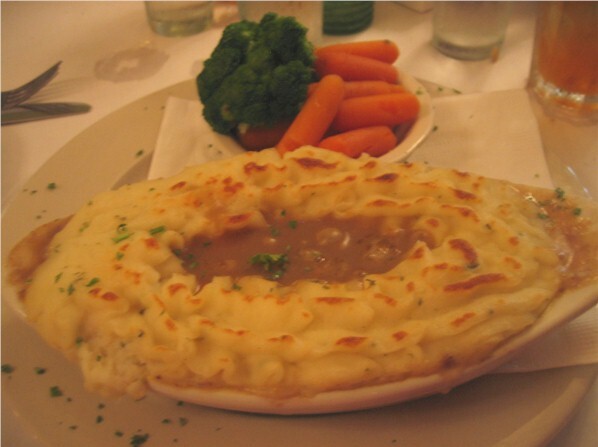 The Shepherd's pie looks like it has a pot pie-like gravy component. I've never seen this in a SP before. How did it compare with more traditional preparations? The gravy / broth was a little thicker than I recall from my last traditional shepherd's pie (which was eons ago) but had a nice flavor. It's certainly worth a try. I think the best thing I have had there is the corned beef, though everything else is good. The corned beef is just really tasty. that none of you tried the "Scotch Egg"
words, a "Scotch Egg Taste-off" - what could be more LTH than that? I've had the scotch egg and it is most definitely skippable. You get a decent salad and iirc ONE egg cut in half. Not my idea of a good way to spend 9 bucks. Oh my, I'm going to Celtic Knot this week. Side note: I said to my wife: "Wow, it's been years since I had a pasty!" She said, "Isn't that the thing that strippers wear?" I replied, "It's been so long since I had a pasty, that the first time I heard of a pasty it was the meat kind, not a boobie kind." Guinness pasty is off the menu for the summer, replaced by a ham and chicken pasty with a Colmans mustard cream sauce. Very Irish and looks yummy though I haven't tried it. I got to to the Celtic Knot for the first time last night. I don't why it took me so long to get there given that I work in Evanston... We had a very pleasant experience. Pub food was very appropriate for a chilly night. I love corned beef (and liver & onions and fish & chips and lamb stew...), but I'd been craving a hamburger all day, so that's what I got. It was cooked a little more rare than I asked for (I'm kinda wimpy with burgers and always request medium-well), but I think they did me a favor as the burger was delicious as served (a solid "medium"). I was also very pleased with their thick-cut fries, which were cooked to a perfect crispness. I will definitely go back there if I'm looking for a burger in downtown Evanston. My boyfriend had the fish & chips. The fish was very nice, but I wasn't crazy about the batter. I think this was mentioned upthread--it slipped off the fish a little too easily, and the whole thing was far too greasy. The faux-newspaper wax paper on which the fish & chips were served made the greasiness extra apparent. I have some friends who think that the Celtic Knot is pretty mediocre (probably why I didn't get there until last night), but it well-exceeded my expectations. I'll probably be back soon. My experience with the Celtic Knot is that things you would expect to be good in an Irish pub are...and you take your chances with things that aren't. I think their corned beef and cabbage is sublime, we've enjoyed the Irish stew, and had any number of dishes that make it our go-to family stop downtown. (I like the fish & chips, as does Sparky, I did notice the slidy batter, but not the greasiness - maybe they had an off night? For me, the fish inside the batter was perfect) These things I like enough to rave about the restaurant and recommend it as one of my Evanston favorites. 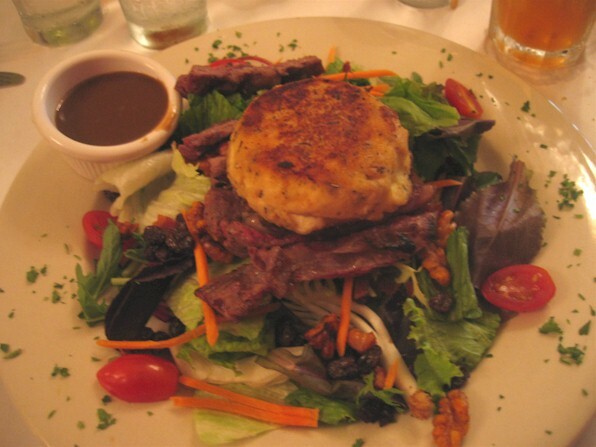 However, other items I've had (usually specials) that strayed from Irish pub were clear misses - for instance, a baked brie and "fried chicken" salad that just didn't work. happy_stomach wrote: I got to to the Celtic Knot for the first time last night. I don't why it took me so long to get there given that I work in Evanston... We had a very pleasant experience. Pub food was very appropriate for a chilly night. I love corned beef (and liver & onions and fish & chips and lamb stew...), but I'd been craving a hamburger all day, so that's what I got. It was cooked a little more rare than I asked for (I'm kinda wimpy with burgers and always request medium-well), but I think they did me a favor as the burger was delicious as served (a solid "medium"). I was also very pleased with their thick-cut fries, which were cooked to a perfect crispness. I will definitely go back there if I'm looking for a burger in downtown Evanston. It has been awhile since I've had it, but I love their lamb burger! Seasoned and cooked to perfection for me! I'm in agreement with MHays here. My wife, who grew up in an Irish household and therefore detests Hibernian cuisine (eight siblings and an Irish Mom who hated to cook--you do the math) always orders a non- traditional dish and is usually disappointed. Whereas, I'm quite happy with the corned beef and some of the lamb items, and I often recommend the place when the spouse isn't around to comment. I love the Celtic Knot, and eat there often. The servers and owners are friendly, the food comes out quick, and the prices are good. I like their pork chops, salmon, corned beef, shepards pie, and they make a pretty good burger. As the boyfriend in question, I have to respectfully disagree. I liked the fish and its batter. The fish was nice and moist and the batter was crispy. There was some grease, but no more than at Wisconsin fish fry on a Friday night. I had been another time to the Celtic Knot and, oddly, ordered a brie and ham sandwich because it was what I was in the mood for. That was very good. I agree that the fries are good for thick cut, but I prefer thin fries. Weiner and Still Champion has the style of fries I like and makes them to perfection. Evanston burgers are a toss up for me between the Knot and WASC. Gus usually wins to be honest, I just love them and the sinful Merkts cheese. Now if I could get Gus to make a cheddar burger with the deep fried bacon on it, I'd surely die of happiness. or a heart attack, whichever came first. DISCLAIMER: I don't work at the Knot anymore so I don't have to type these stupid disclaimers ever again! Octarine wrote: Now if I could get Gus to make a cheddar burger with the deep fried bacon on it, I'd surely die of happiness. I don't think u would have to twist my arm on that one. We celebrated my father-in-law's 80th yesterday and I felt the need to write about the exemplary service at The Knot. We booked The Snug in back. We were able to come in early to decorate, and we were introduced to Tom, who took care of us the whole night. There was a busser to help clear away the dishes as well. The trays were brought out on a rotating basis, the dishes replenished quickly, and we were kept apprised on the bar tab, which we were astonishingly well under. Tom even mentioned to me what a nice group we were and how he liked working with us. We ordered the sausage rolls (good), brie wrapped in phyllo (very good), pasta salad (very good), corned beef/Swiss sandwiches (I heard these were tasty), BBQ beef sandwiches with coleslaw (delicious, especially the next day), stuffed mushrooms (the only report I heard was not favorable), brownies (cake, but good), mini pies (to die for), and a veggie tray and fruit tray, both with lovely, fresh produce. The Snug is exactly that, but if you're looking for a space for a small party, I highly recommend The Knot.